All three vases are beautiful, thank you for explaining what we are seeing and why one works better than the other. I used some gladiolus today too. 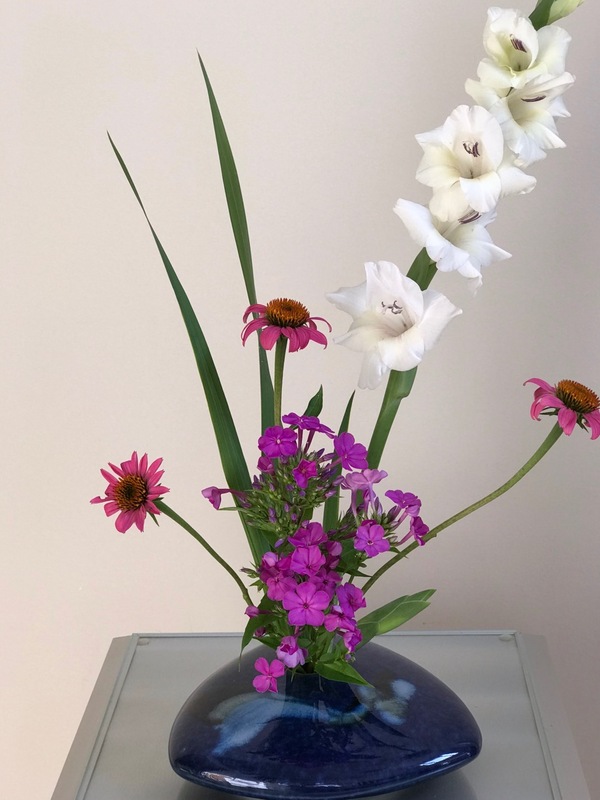 I like the balance of the last vase, but I didn’t understand. 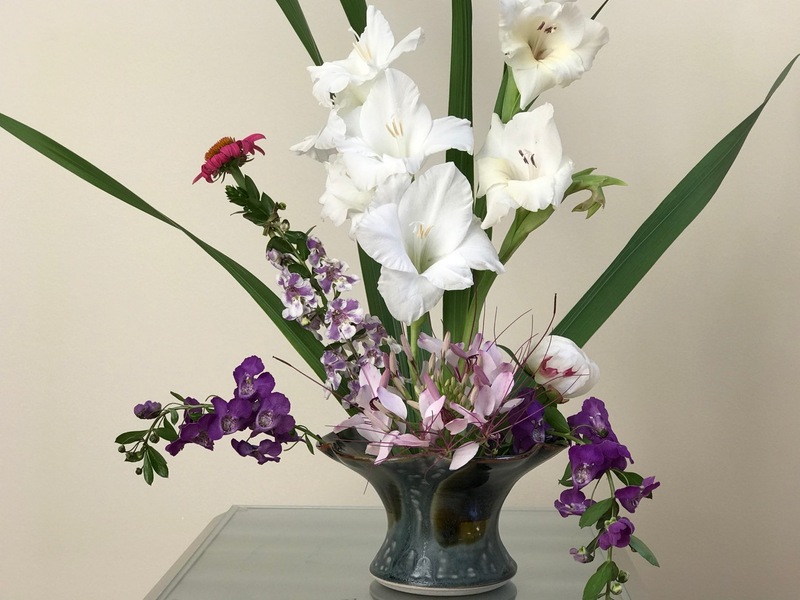 Did you re-do the first vase or use more of the same flowers? Thanks Christina. I wasn’t satisfied with the first vase so I reworked it into the third one. Mostly the same flowers repositioned. You have a lot more patience than I do! But it was worth it. I am enjoying working with the abundance of blooms and trying different colours together. I definitely prefer the third one for my own taste. I think you nailed it when you said: Grouping similar colors makes their impact cleaner and more direct. That third vase is a perfect example. 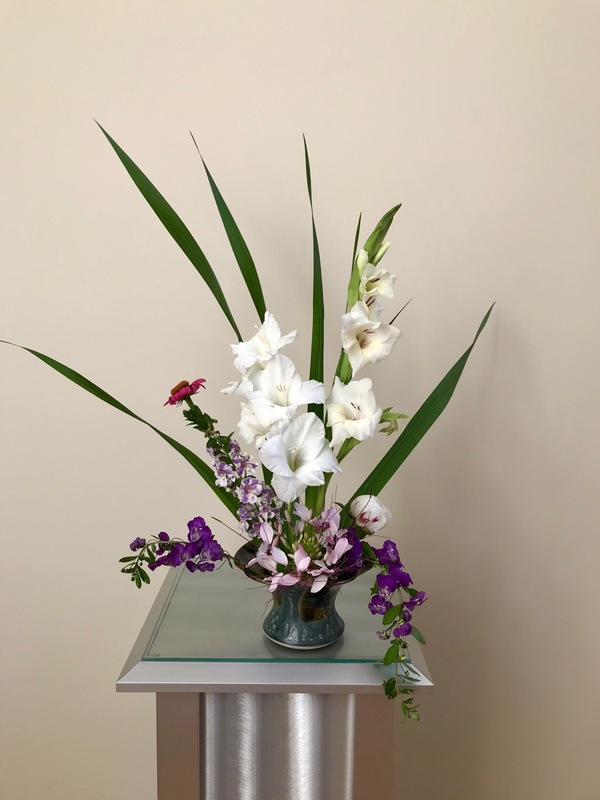 I have always found Glads to be a difficult flower to use in a vase, even though they are so pretty. 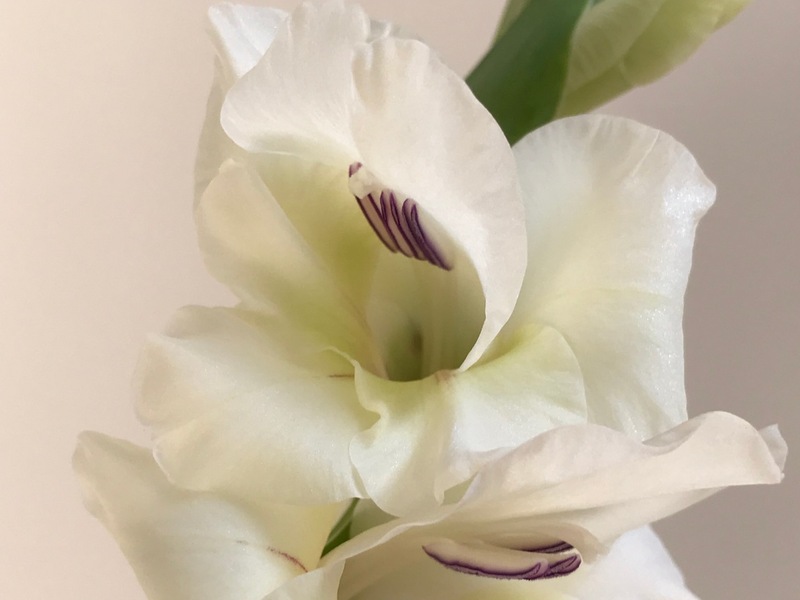 Glads don’t maintain the shape of the design for long because each bloom dies back from the bottom. 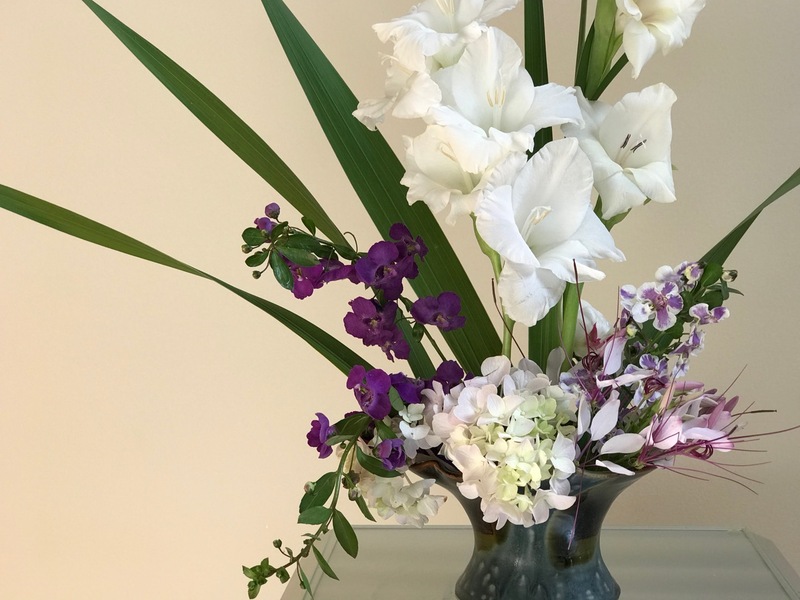 I remember how just a simple set of various colored glads in a vase kept my grandmother happy. She trimmed them every morning and added fresh ones for weeks. Susie you created three works of art! If I have to pick a favorite it would be the third but only by a slim margin. Those glads are really amazing. I grow dwarf ones, but they are not ready to bloom yet. I have a neighbor whose glads come back every year so I am trying to see if mine will return too by mulching them in a bit more this winter. Thanks Donna, that’s my favorite also. Hope the mulch trick will protect your glads. Here they will come back for several years. Thanks, they all make me happy. 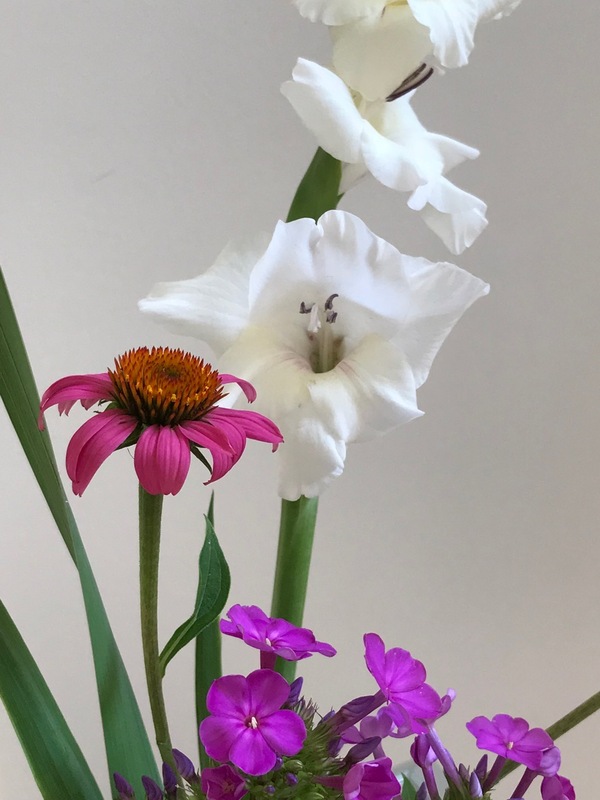 Love those glads, are they more heirlooms? I like the third one better, too. Thanks. The glads were all from past years although our dry weather is putting an end to them now. 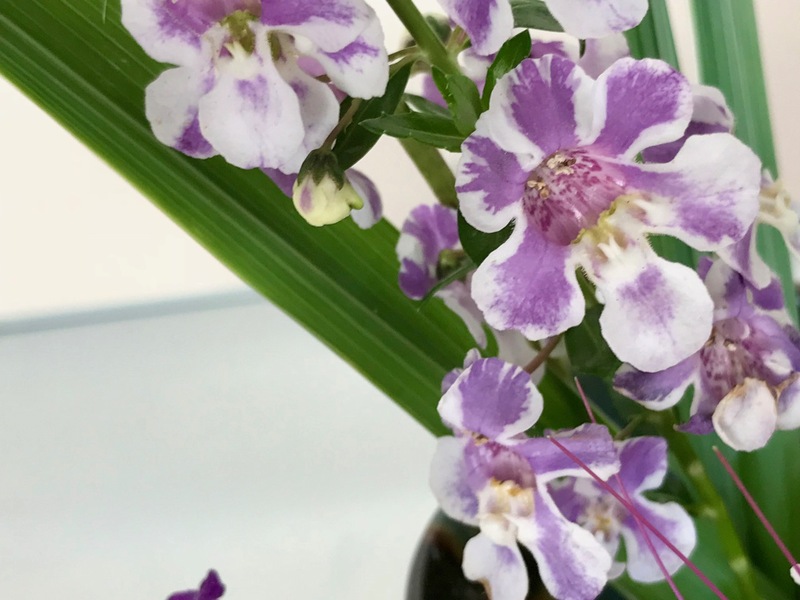 Your Angelonia is truly lovely and goes so well with your creamy white gladioli. Thanks, Angelonia is so reliable too. 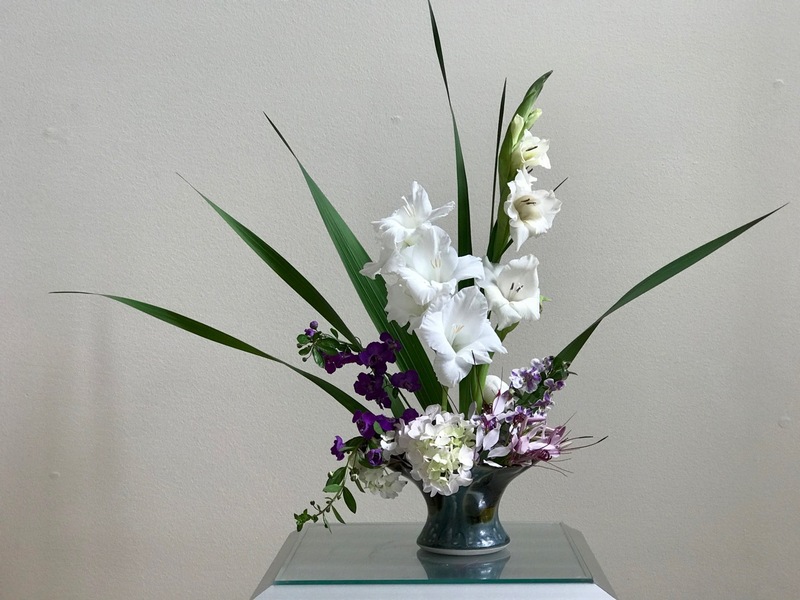 An impressive array of flowers and skill at creating fabulous arrangements with them. You have a perfect white background and gorgeous pedestal for displaying these! Thanks Peter. That is a good spot but the color of the background is so difficult to control. Just within a few minutes the light shifted a lot. I wish I had both your patience and your mastery with floral arrangements, Susie. The third arrangement is my favorite too but I’d be pretty proud of all three had I created them. You’ve succeeded in convincing me that I need to try glads in my cutting garden next year. Kris, less patience and mastery than pure stubbornness on my part probably, but thank you! 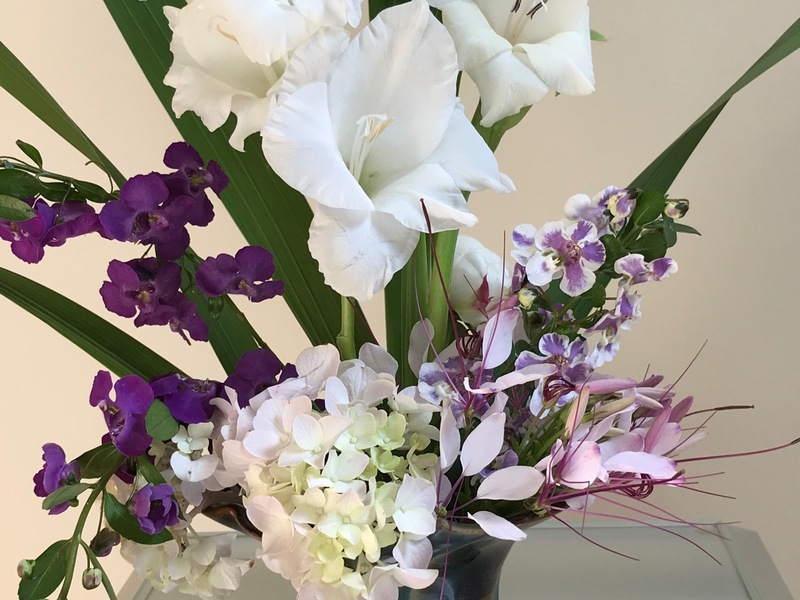 You can’t go wrong with gladiolus. Inexpensive bulbs that are easy to get to bloom. You may have to irrigate them. Mine have done better I think because we had lots of spring rain. 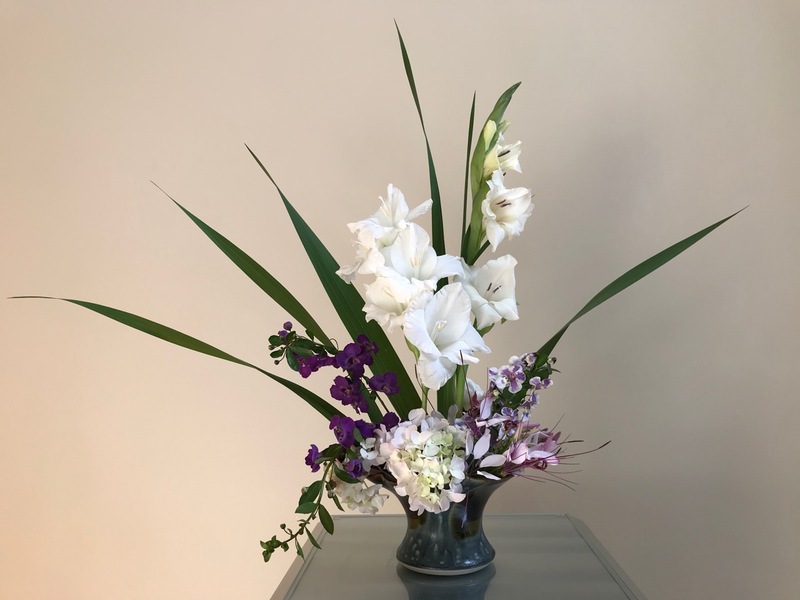 I think my favorite element in the last arrangement is the linear quality of the leaves. Thanks for taking us through your process. Hi Ricki, nice to hear from you. Hope you’re doing well. I too love those leaves. Glad or iris, that shape is a good addition. So pretty, I love the angelonia, I have never seen it for sale here. I first came across Angelonia at a garden center a few years back. 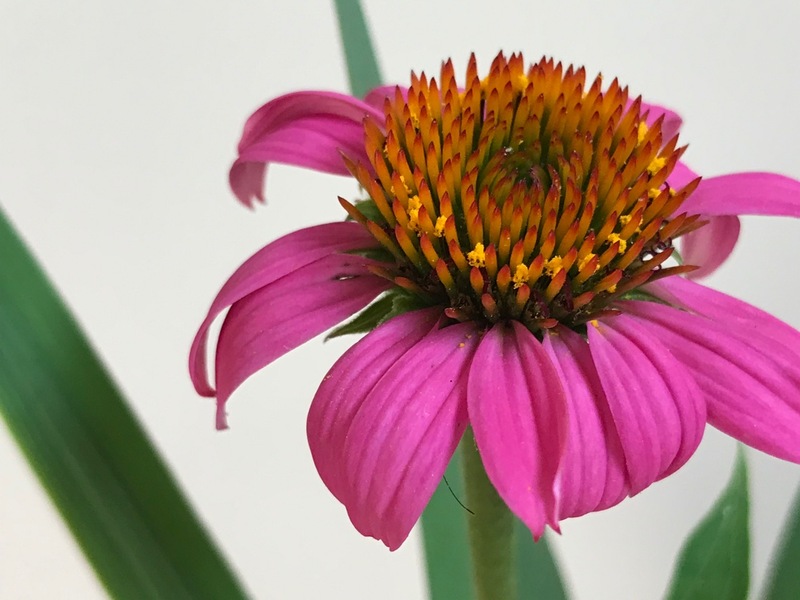 The plants were rather pricey and colors limited, but now landscapers have discovered it and planted it in every suburban entrance and roadside border for miles and miles. It is so carefree, I hope you can find some. 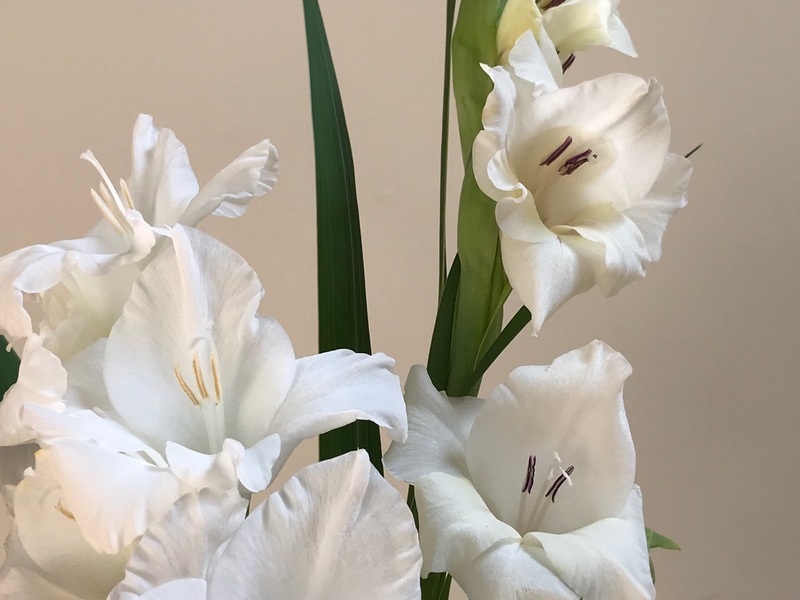 When I got my cheap bagged gladiolus, they seemed to be as white as the fancier varieties that were more expensive. I sort of thought that they were the same variety, but have no way of knowing. They were just labeled as ‘white’. 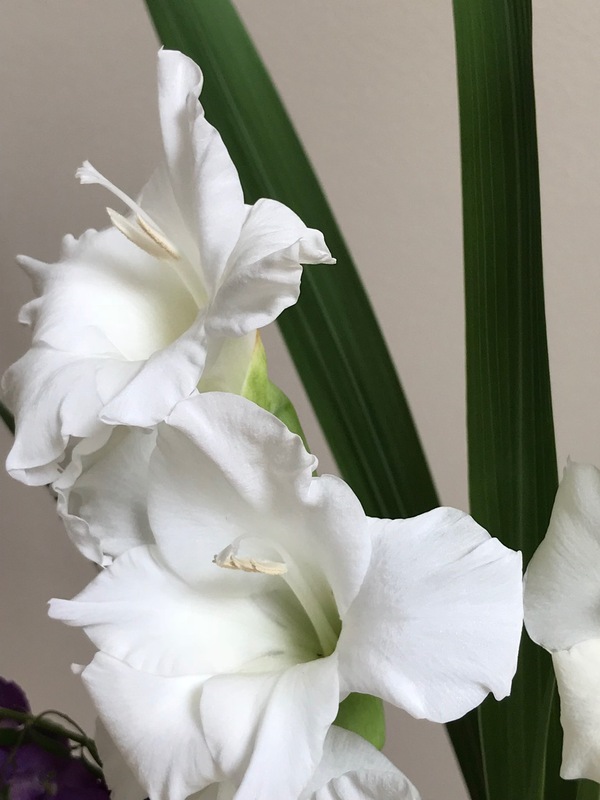 I do not grow many colors of gladiolus, and often just white and one variety of red. Many years ago, I grew yellow and orange because they fit the building that they were in front of better, and they were really cool. They remind me to try other colors besides my favorites sometimes. I buy that same kind–white! Or sometimes a mixed bag. Those always turn out mostly pink. 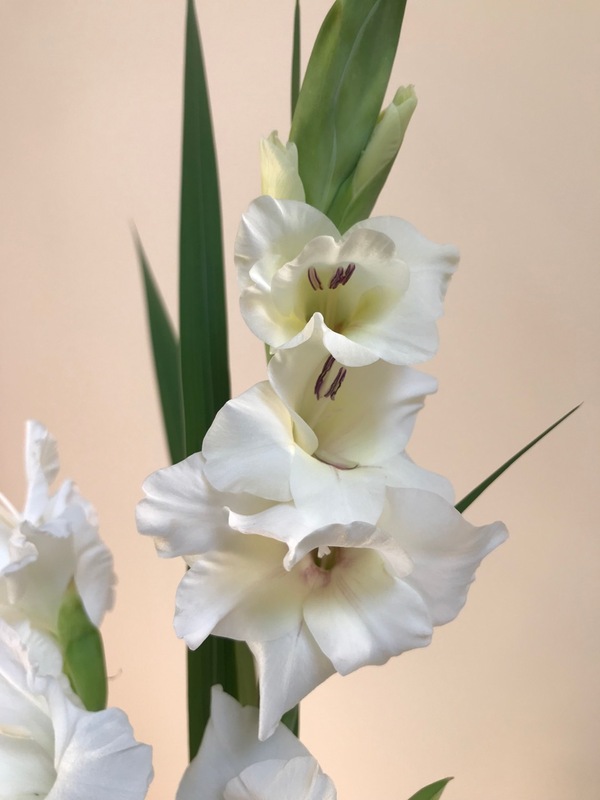 Gladiolus really excels at white, and they are the strongest growers. Pink is my least favorite color for them, but I never met a pink gladiolus that I did not like either. Thanks Judy. The first one took the most time and fuss. It’s nice to have flowers to play with. Stunning–all three of them! 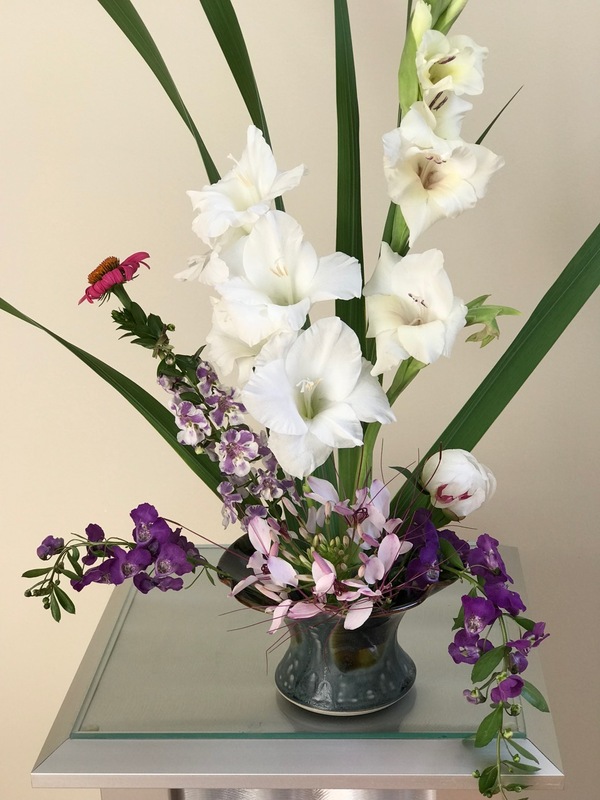 I so miss Gladiolas: I used to grow them, but they stopped liking my garden for some reason. I may have to try to give them a go again! You’ve inspired me! 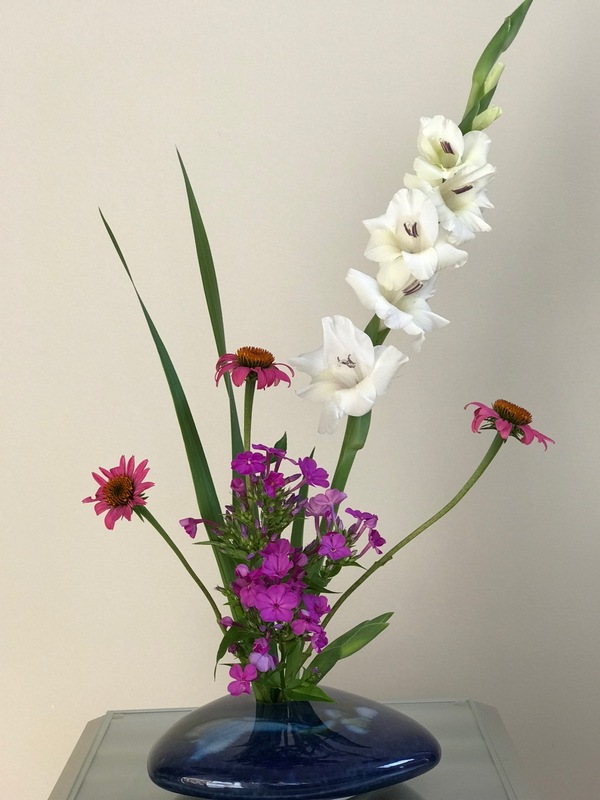 Gladiolus with Phlox and Echinacea – nice and unusual combo! Oh my, each creation is stunning in its own right. 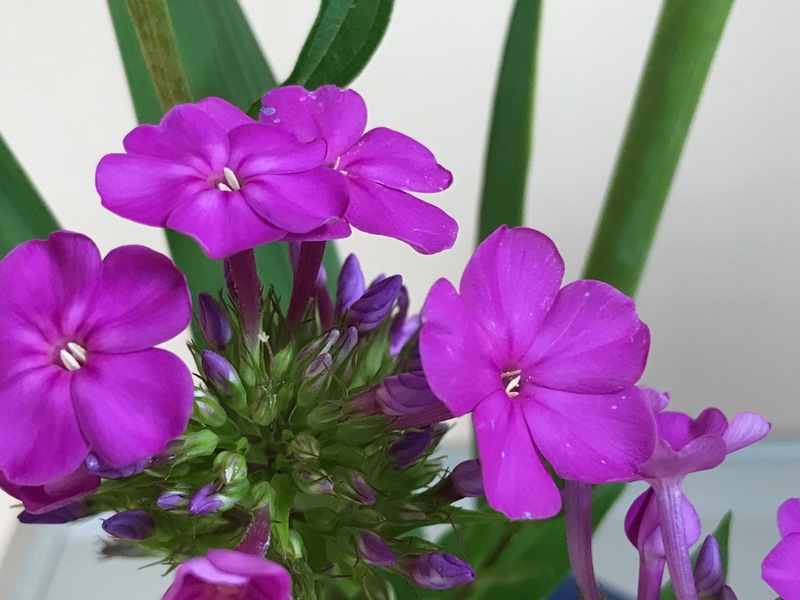 What lovely blooms to work with! I bet your garden is overflowing with gorgeousness! Thank you. Some individual flowers are looking nice here but I haven’t whipped the garden into shape enough to show long views. We finally had rain today after none for many weeks.